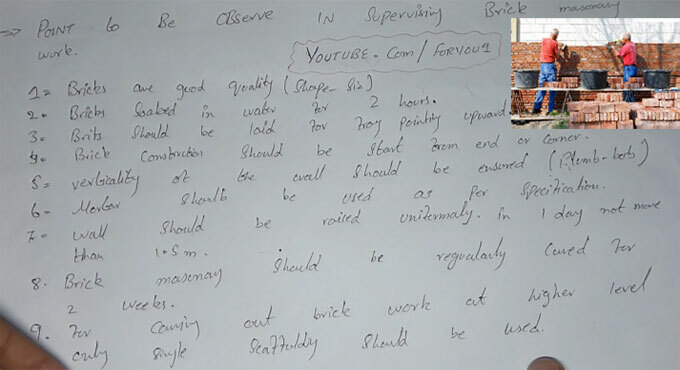 This construction video tutorial will provide some useful guidance for examining brick masonry work. Ensure that the superior quality bricks are used. Brick are drenched in water for 2 hours. Bricks should be placed in tray with upward direction. The construction of bricks should begin from end or corner. Make sure that the verticality is maintained for the wall. Mortar should be applied by adhering to the specification. The wall should be elevated consistently in 1 day not surpassing 1.5 meter. Brick masonry should be cured for 2 weeks on a regular basis. For accomplishing brick work at higher level, only single scaffolding should be employed. Masonry scaffolds make brick or block laying process more secured and efficient when working higher.